Lived in Bacup (Lancashire) for five years. My Mother and Father were involved in the church, my Father being a Baptist minister, teacher, preacher, clarinetist, and rather fine chap all round. Check out www.Bible4today.com which is a collection of my father’s Wisdom over the years, including Cooke’s Tour of The Bible and Thought for the day. My mum was amazing, and a fine singer! My best friend was a small bear called Barley Sugar, which I still have! We moved to Hinckley (Leicestershire); and after a further seven years, moved to Purley (Surrey). I have one sister, Bev, who is terribly clever and has virtual doctorates all over the place. She has worked in research, and frightfully brainy areas. Now she is an excellent teacher and is a very patient encourager with the little blighters! I started playing the piano when I was six years old, learning the usual stuff, and happy in retrospect to have learned reading and playing the traditional way. When I was eleven, my sister got a guitar for Christmas along with a guitar manual written by Billy Bell. I stole the guitar from her and started to teach myself to play using the tutorial and other bits I had picked up from old records laying around the house. Ripple dissolve several years later I was fortunate to fix Billy Bell for a BBC radio session and I told him about my first steps on guitar and how he’d personally inspired me. He shattered my romantic illusions saying that he’d simply agreed to have his picture on the front cover of the book in exchange for a free amplifier. That is so Rock and Roll eh? I started learning double bass at school, mainly because nobody else wanted to and there was a vacancy in the orchestra. But I was desperate to get into a band and play guitar. I continued with the piano, learning quite a bit by ear, my father teaching me to play the blues at an early age. Playing 12-bar duets with him was real fun and this became one of the bedrocks of my music education. I moved to Purley when I was 13 years old and started learning the double bass properly with classical tuition, but then started to rebel against the usual dross inflicted on school orchestras, instead favouring the weekly jazz band rehearsals. They were led by a 'real jazz musician' and not a schoolteacher, so it was very cred. to be part of this outfit and I quickly progressed to playing drums which was much louder and much more fun. PC World, Harrods, British Airways, Debenhams, North Thames Gas, Guinness, Office Angels, ICI, Evening Standard, Woman’s Own, Swatch, Daily Mirror, UCI, Kodak, Airtours, JS Sainsbury, Duckhams, Thomas Cook, Lucky Charms, BBC Licence Fees, Auto Express, British Rail, Jammy Dodgers, Cellnet, Great Thorpe Park, Thunderbird, Bentalls, EasyJet, Tom Caxton Beer, Rapport, Nottingham Evening Post, Diamond Cable, PhoneZone, Global Internet, Warner Brothers and many more. I was also involved in a R'n'R band in my local church inspired by an older band called The Channels. They realized that they were getting older (18-19) and they wanted to pass on their ideas, songs and instruments, yes, instruments, to a younger lot, and they chose me to start this up. I always ended up playing what nobody else wanted to play which at the time caused some confusion, but in retrospect was a great grounding in learning a little about everything. We used to gig in coffee bars, and clubs most weeks, and it was so much better than doing schoolwork. I think this drove me further away from straight musical activities, as well as science, and an obscure offer from my headmaster of becoming a fireman (!?) I pursued further the jazz band and various mixtures of groups and combos. I also grew my hair doing pretty good Jesus look-alikes! My A-level art teacher, Mike Davies, was a brilliant sax player. One day he asked me if I would be interested in joining him and his trio in playing at a Saturday night function somewhere. There was money in it and if it went well there could be more gigs. This was my first paid gig and having finally worked out how to get the wacking great double bass to various venues (thanks Dad) I continued with them for a good period of time whilst still at school. I was still banging away on guitar and piano as well, and decided to get some formal tuition on drums. I had several lessons from a jazz drummer called Tony Taylor who helped to solidify things both in the jazz band and in the rock band at church. The church band was called Southern Travelers Handbook Jesus Band and we were gigging quite a lot by now. (What a daft name!). One weekend, we were playing at a local festival in Purley where the guest artist was a singer called Judy MacKenzie, of whom we had heard and liked very much. As it turned out, she liked our band, and especially me, and asked us to accompany her on all of her future gigs (much to the displeasure of her management and those that had booked Judy as a solo artist). One thing led to another and Jude finally asked if I would accompany her personally as her guitarist to play all her gigs including TV, concerts, gigs abroad, clubs etc. I went for this big time and suddenly I had become a professional musician and performer- in every way............... except of course financially. I was involved in gospel music at the time, but decided with Jude that we would try to explore other areas. We met a musician called Curly Clayton, an old school session guitarist who owned a small 3-track studio in Highbury. He listened to our material and promised that he would secure a record contract for us within six months. This he did, and we signed to EMI. 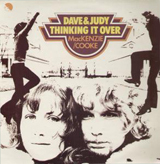 Jude and I made one album for EMI called Thinking it Over produced by the lovely Wally Ridley, and arranged by Harry Robinson. Soon, I started getting work writing for TV, audio visual, corporate video and session work as a guitarist. After a period of about two years, which concluded with a publishing deal running its full term, Jude and I got back together again and started writing songs to secure another deal. We met up with George Fenton, who, with his partner, became our managers and we recorded and produced a few tracks over a short period of time. Although nothing really came of this, George and I became friends and we worked together on several productions and I would often dep. for him on some rather odd classical gigs he was offered. Mahler symphonies and Hans Werner Henze Avant-Guard operas! I met Norman Stone who had just completed his training at RCA and he offered me several productions including BBC TV's Sunday Gang (on which I met Tina), Support Your Local Poet for ITV and a series of animation films and TV pilots. Thanks Norm! Here's a small chunk from the very first Sunday gang show broadcast in 1976…featuring my first wife! Interesting to note that you could walk straight into BBC Television Centre without saying who you were back then! I was called one day by Cliff Richard's management who were looking for the support act at one of Cliff's gospel tours. I had been working with Paul Field and his band Nutshell, and they had been suggested as a suitable support. I was booked for this, to MD and arrange the songs for the tour. I had felt for some time that the emphasis was moving away from guitar and moving towards piano and keyboards, so I quickly got out the piano books, swatted up a little and bluffed my way into keyboards, synths, programming and all things relatively “high-tech”. The next tour that came up again involved Nutshell (now called Network 3, or Nutbush, or Ner-ner-ner, whatever!)) They were the support band, but I was also asked to play second keys with Cliff's band which meant doing both bits of the show for the whole run. This was brilliant and I met and became chums with some really great players including the late Graham Jarvis, John Seamore, and Stuart Calver. This is a picture of the last tour I did with the crew. I continued with Cliff for a further 4 years and he remains a good friend, particularly when we go to Portugal. For the past several years, I have been spending my time working in my Studio in Twickenham. Writing, Composing, Producing, Arranging, and shouting at gear that won’t work. I have been involved in pretty much all forms of TV, Film, and Media composing and production. Still married to my very first wife Tina Heath, one time of Blue Peter and Lizzie Dripping (although I had never heard of her until I started work with her on BBC TV's Sunday Gang). Tina left Blue Peter to have Jemma and has spent time with Jem and Ames bringing up the family as well as doing public appearances, voice-over and acting work. Here is some her extensive and impressive CV. Television - Lead characters - Eleven O'clock Shadow series for Thames TV, Cloudburst, BBC TV Series, Maidens Trip, BBC TV Series Sunday Gang for BBC TV several series, Target, BBC feature episode, You and The World, Thames series, Churchill's People, BBC TV The Sweeney, Euston Films, Couples, Thames Series, Girls of Slender Means, BBC Series, The Linden Tree, BBC play of the month, Black Beauty, LWT, Yesterday's Girl, Granada TV, Lizzie Dripping, BBC several series, Astrofarm, Filmfair, Carlton TV Drama, Toad of Toad Hall for BBC Lizzie Dripping stories. Presentation - Cooke’s Tour of The Bible, Blue Peter, Tina Heath's Personal Choice, New Ideas, You and Me, Marathon Sunday Special, Through The Year audio series. Books and Magazines - Tina Heaths Book of Babies Names, Columnist for Mother magazine. Films - Christiana (winner of American Academy Award for Best Supporting Actress). Jem has been singing and recording from an early age. Her first job was for Evening Standard when she was 3 years old and for which she won several advertising awards! Since then, she has been involved in equally successful advertising commissions, as well as TV and album tracks. She performed on the Astrofarm titles, voice-over and vocal performances on CPK films The Audition, The New Kid, The Clubhouse, The Screentest and Saturday Night. Jemma can be heard on The Cooke Files Showreel singing Find My Way To Your Heart and Beautiful Day, although she was quite young at the time. Here is Jem’s showreel of TV and jingles. Also check out myspace.com/jemcooke where you can read more about her and hear some of the songs we’ve written together. Check out Performance here for more songs. Amy Francesca Cooke - Ames - Stomper. She has appeared on CPK films and albums, as well as the New Rocky Kids albums. Several vocal sessions for BBC Radio school projects for Kate Walker, Blue Peter, and many more. She is a talented illustrator, and has spent the last couple of years working as a producer and casting agent, and has now started at university studying photography.